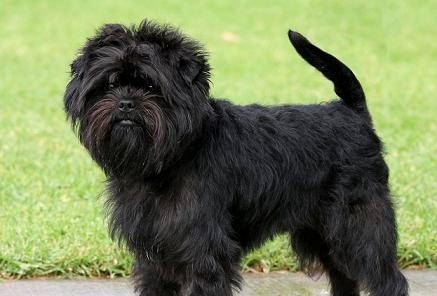 The Affenpinscher is funky and tiny, weighing between 7-10 pounds. This breed is easy for grooming, but is prone to some health defects and are difficult to train. They grow to roughly 11 inches tall, maximum. This dog was bred in Germany in the 17th century as a hunter to get rid of the population of rats in homes. Today they are more like companions. They are known for their short jaws, and pouty look. Their faces look like monkeys because of the pushed in ape look. In German, Affenpinscher translates to monkey terrier, hence the name. This dog is perky, quirky and very scruffy. The Affenpinscher needs to be combed once or twice a week but nothing excessive is required. Their coats are most often rough and shaggy, and usually black but comes in all sorts of colours. The hair is about one inch long on its body and a little longer on its chest, neck and head to provide protection. Vet bills could be high for this pooch. This breed is prone to a few health issues. The eyes, teeth, hip, joint and heart issues are most occurring. Their average life span is 12-14 years. They can be mischievous but are good with other dogs and pets. Training is very difficult, as well as house breaking but they are fine for travelling. Because they are very small and get injured easily they are not recommended for families with small children, but are very energetic and entertaining. They are content with indoor exercise, play and love to monkey around. Their behaviour can also be described as active and curious. Do you share any personality traits with this dog? If so, think about how perfect the Affenpinscher fits into your lifestyle as an ideal pet for you, but who wouldn’t want a small pet that is as cute as a monkey. If not there are many others to choose from.